The sparkling splendor of this Britannia Gem Ring implies a royal recipient. The perfect picture of a royal accessory, this ring has an overall look and style that would fit the finger of a regal queen or a powerful lord. This stunning accessory is crafted entirely in quality pewter with noble lions displayed in the setting. 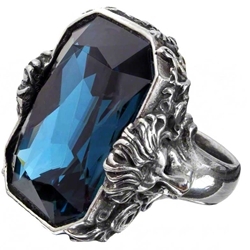 The centerpiece of the ring is definitely the Swarovski crystal, with its large size and its deep blue coloration. This Britannia Gem Ring speaks strongly of nobility and sophistication, making it an inherent must for those who require such qualities out of their look.